Lainie Friedman Ross, M.D. Ph.D.
"Clean Blood, Clean Money: Kidney Disease Transformation"
Joel Solomon is the Chair of Renewal Funds, Canada's largest social venture capital firm. With $98m assets under management, Renewal Funds invests in organic food, green products, and environmental innovations. Joel is a Senior Advisor with RSF Social Finance, founding member of Social Venture Network, Business for Social Responsibility, the Tides Canada Foundation, and is Board Chair of Hollyhock. "Navigating the Exciting Pathway from Spontaneous to Induced Tolerance after Adult and Pediatric Liver Transplantation"
Dr. Sandy Feng is a transplant surgeon who performs liver, kidney and pancreas transplants. In her research, she studies the potential for bone marrow derived cells to contribute to liver regeneration and has been the recipient of research grants from the Juvenile Diabetes Foundation, American College of Surgeons and American Society of Transplant Surgeons. Feng is a graduate of Harvard College, where she received the prestigious Marshall Scholarship. She earned a doctorate in molecular biology at Cambridge University and a medical degree at Stanford University School of Medicine, followed by a general surgery residency at Brigham and Women's Hospital in Boston and a transplant fellowship at UCSF Medical Center. Feng has been an organizer and participant in several national conferences addressing issues critical to the transplantation community. She is a professor in residence of surgery at UCSF. "Solid Organ Transplantation: The Child as Donor and Recipient"
Dr. Lainie Ross is the Carolyn and Matthew Bucksbaum Professor of Clinical Ethics at the University of Chicago where she has appointments in the Departments of Pediatrics, Medicine, Surgery and the College. Dr. Ross is also the Associate Director of the MacLean Center for Clinical Medical Ethics, with specific expertise in Transplantation ethics. Dr. Ross serves as a member in the United Network for Organ Sharing, the National Institutes of Health and on the U.S. Department of Health & Human Services Human Research Protections committee. Dr. Ross is a graduate of Woodrow Wilson School of Public and International Affairs. She has a medical degree from the University of Pennsylvania, and she also obtained a master's of philosophy and a PhD from Yale University. Dr. Ross has published over 60 peer-reviewed articles and two books called Children, Families and Health Care Decision Making and Children in Medical Research: Access Versus Protection both of which were published by Oxford University Press in 1998 and 2006 respectively. 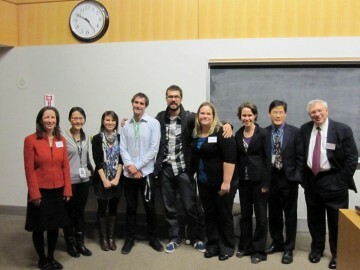 Congratulations to our Transplantation Research Day award winners.